Here Comes The Sun(rise)… At MacRitchie Reservoir | JustRunLah! As sure as the sun rises every morning, someone with a camera on hand will snap a picture of it. Admit it, there must be at least 1 to 5 sunrise pictures in your phone now. Yet the next time you see that big ball of fire rising over the horizon again, the phone comes out again to shoot it. I believe it isn’t just because it comes out differently each day, eg. more orangey-sky, more dramatic, etc. Its because a picture can never capture fully that overall feeling of you, and everything around you, basking in the glory of the morning sun. Which means, a sunrise is always better experienced than be seen on a flat screen. Why settle for a 77″ OLED TV display, when you can view it ala-IMAX, ie. as in real life. And one of the best places to do this is at MacRitchie Reservoir. MacRitchie Reservoir at the trail entrance near St Theresa’s home, A group of runners with headlamps about to enter the trail in the early morning. Like going to a party, you have to prepare and dress up for it. 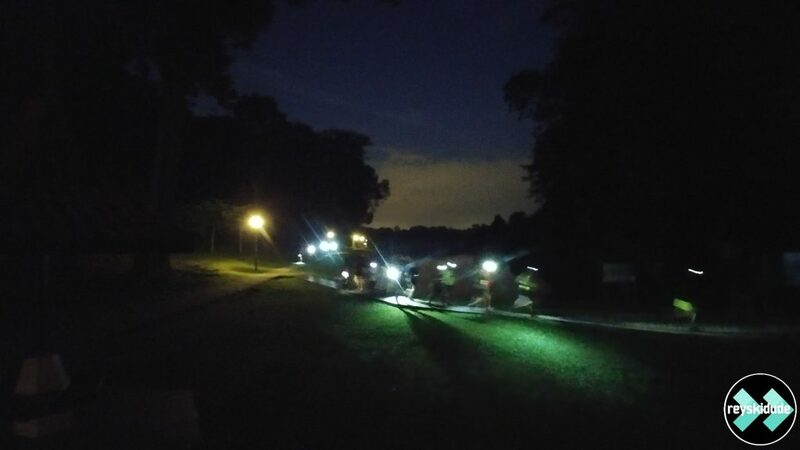 In this case, put on your trail running gear, a headlamp and be at MacRitchie before 630am. Go to the trail entrance near St Theresa’s Home to start the loop anticlockwise. Yes, a good way to sweat out the booze and greasy beer food you had the night before is to do 10 km of trails very early in the early morning. At this time, though its the start of the blue hour, it is still almost pitch black under the forest canopy. But you’ll be surprised that there are people already in the trail walking about, and some even without any lights! Give them a friendly “Morning!” greeting to assure them you are not some zombie lost in the woods. I’m sure they’ll reply the same. Else, you may want to speed up in case THEY are zombies roaming in the woods. And, point away/down your headlamp when you run into someone. Just basic manners. Don’t be like those guys in the PCN that I wrote about. By the time you reach the Ranger Station around 645am, the trail is more open, and dawn is breaking but the sun isn’t up yet. Running along Sime Track should be manageable without the headlamp, so save your batteries. When the track turns left, there’s Jelutong Tower. A good time to have a break from running if you feel like, though you have to take 6 flights of the spiral stairway to the top observation deck. The sky may have started to get a little orange-y here when you get up there, and also from this outpost its also good to hear some of the wildlife slowly stirring up. There must be a hidden Starbucks there for the macaques to get their morning espressos. Back under forest cover and just about 300 meters down Golf Link, there’s a nice boardwalk. This is along the border of the nature reserve and a country club’s golf course on the right. Its just a short 500m long elevated wooden path but lush and green all around. Then when you find yourself out of the forest again, it starts to get interesting as the reservoir is suddenly in front of you, with the skies and trees joining in the frame, the view getting more and more picturesque. From here, its about a half kilometer of spots available where you can take as much pictures you as you like. But for me, the best viewing spot is on the bridge where the water flows between reservoir and the lake at the golf course. (FYI – The video actually covers the whole 10K loop, so you can skip to different parts of the route and analyze with the metrics, eg. elevation profile, grades, landmarks, etc). Another spot would be just after the bridge when the path turns left. There is a tree that is near the water. With the sun behind it, and if the pavement was actually some rustic stone path, I could imagine Frodo and the hobbits walking by… on their way to play golf. 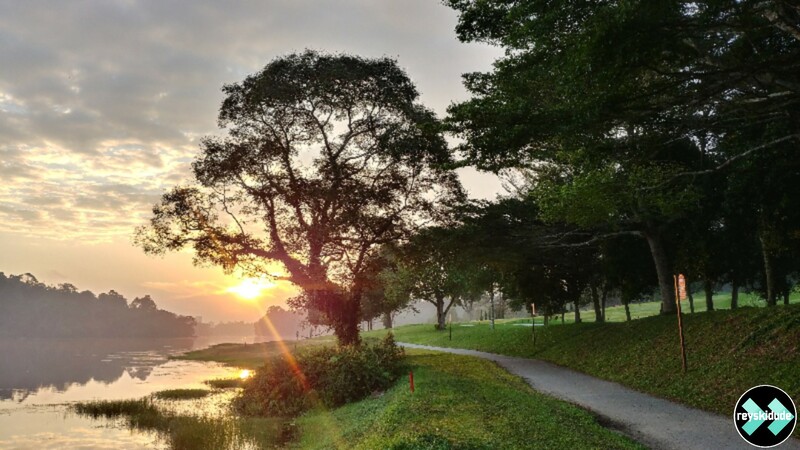 Sunrise through a tree on the banks of MacRitchie Reservoir along Golf Link path. So, had enough pictures? Then head further down into the forest again to complete your 10km loop. You’ll notice its starting to get more busy in the trail in the last 2-3 kms or so. 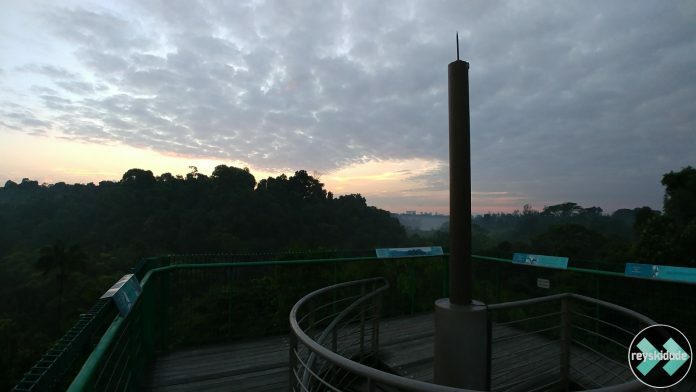 This is the part that might make you look back and appreciate being very early MacRitchie when it was still very quiet and peaceful, enjoying your run while the air is still cool, and of course that glorious sunrise. Oh, and to top it all off, its also great that they have shower facilities there.